A Certificate of Incumbency is an alternative to the Companies House issued Certificate of Good Standing. The document is used as evidence of various details relating to a company. The need for this document can arise when opening a bank account; to support a loan application or as evidence of the company details. We make the apostille service as simple as possible. Please note that this service is suitable for Limited by Shares, Limited by Guarantee or Limited Liability Partnerships only. We cannot produce a Certificate of Incumbency for Limited Partnerships. For only £116.00* we will issue the document and arrange for this to be solicitor certified and issued with the apostille. * The fee is £54.00 for a certificate that has already been issued and certified by a UK solicitor or Notary Public. We can issue the document if needed. Please contact us for advice. What information can be shown on a certificate of incumbency? As standard, this document will confirm a company's name, registration number, incorporation date and a statement to confirm a company is up to date with it's filing requirements. For just £116.00 we can-. Issue the document with the information you need. How to order an apostille for your certificate of incumbency? Simply purchase this service online and let us know the company name, registration number and the information you would like us to include on the document. 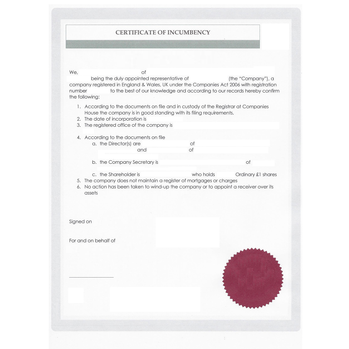 If you have already obtained a certificate of incumbency you should first arrange for this to be certified by a UK solicitor or notary public. Following this you can purchase the apostille only service online and post the signed document to us.